The new book, entitled From Bessel to Multi-Index Mittag-Leffler Functions: Enumerable Families, Series in them and Convergence, published by World Scientific, is a contribution to this concept. It is a complete and comprehensive theoretical study in the special functions field, with its main topic emphasizing on special functions series and convergence of such series in complex plane. Special functions of fractional calculus are now unavoidable tools for handling various mathematical models of integer or fractional order, when looking for explicit solutions. The Bessel, Mittag-Leffler functions and their generalizations constitute an important field of Applied Analysis, and are useful for pure mathematicians, applied scientists and engineers due to the increasing interest in both classical and non-conventional models coming from theory and practice. Readers interested in problems related to analytical solutions of various differential and integral equations of arbitrary order modeling some real processes, would benefit from the book's detailed study of such series. The text is self-contained. From Bessel to Multi-Index Mittag-Leffler Functions analyzes this topic through the study of enumerable families of different classes of special functions. 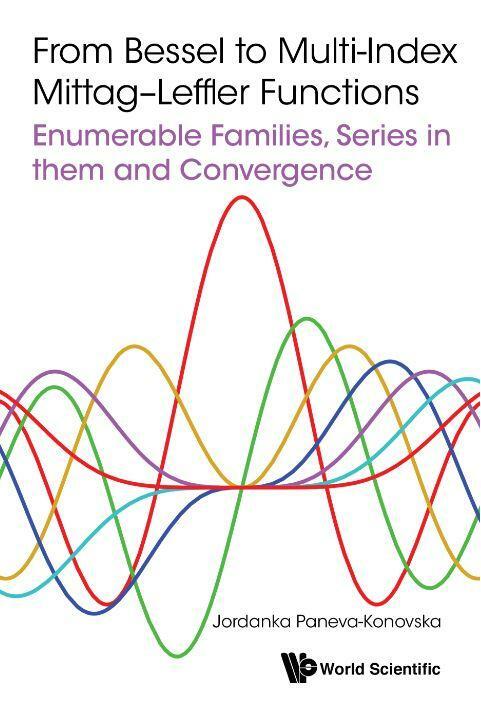 Enumerable families of the Bessel and Mittag-Leffler functions and their generalizations are considered and the convergence of series in them is investigated. Providing a unified approach, analogues of the classical results for the power series are obtained, and the conclusion is that each of the considered series has a similar convergence behavior to a power series. Also studied are various properties of the Bessel and Mittag-Leffler type functions, including estimations, asymptotic formulae, fractional order differentiation and integration operators. The book caters to pure and applied mathematicians, applied scientists in natural and social sciences, as well as engineers. And retails for US$102 / £85 at major bookstores. To know more about the book visit http://www.worldscientific.com/worldscibooks/10.1142/q0026. Jordanka Paneva-Konovska is an associate professor at the Faculty of Applied Mathematics and Informatics, Technical University of Sofia and Institute of Mathematics and Informatics, Bulgarian Academy of Sciences. Her fields of interest are: special functions, series in special functions and convergence, complex analysis, integral transforms, fractional calculus. She is an author of more than 50 scientific articles on the mentioned research topics and an advisor of 1 PhD Thesis. She is a member of the editorial board of the International Journal of Applied Mathematics, and organizing committees of a number of international conferences, and a reviewer of several specialized international journals and conferences in the area of special functions theory, fractional calculus and applications. She is a member of the Bulgarian Mathematical Union and Union of Scientists in Bulgaria.